What does an Indian software development company have in common with a royal Russian jeweler? Today they both seem to have a firm spot on the first page of the Google Doodle search. Maker of the exquisite Fabergé eggs, Peter Carl Fabergé was born 159 years ago today in Saint Petersburg, Russia. His name lives on for of the intricate jeweled Easter eggs he created for two Russian tsars and wealthy patrons in the late 1800s and early 1900s. Google has dressed its Doodle up for the day in an ornate homage to the artist. 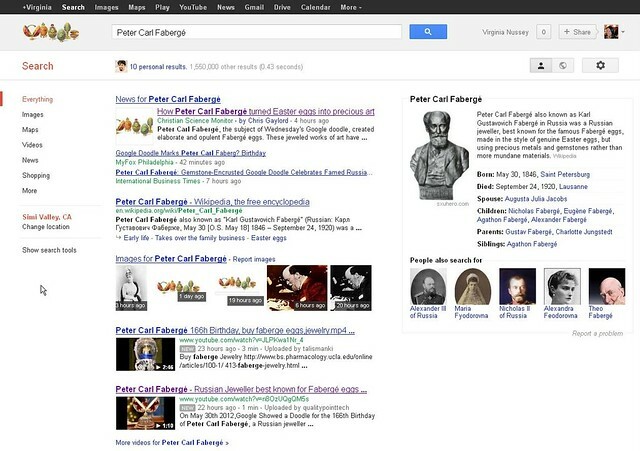 A click of the Doodle brings the searcher to a search page for Fabergé. The key to Fabergé eggs is that, along with being beautiful, each also holds a surprise. On further examination of the search page, there’s a surprise lesson within the results. Strike when the iron’s hot, but first ask what the value will be for the brand. Last week Jessica wrote about what can happen when marketing piggy-backs off the popularity of trending topics in Harnessing the Right Now. There’s obvious opportunity in being among the first to offer content on a hot and rising issue. Aged content may see preferential treatment by search engines. And content on trending topics is, by definition, in demand. If the topic is a good fit, capitalizing on trending topics can be advantageous for traffic and brand awareness. It’s worth careful thought, however, to see if the fit is indeed right. While the cost of developing content can be cheap, putting resources into creating and promoting content is still a decision that should have the backing of strategic direction. Don’t you think? Like, what do you think of the second video result on the results page for [Peter Carl Fabergé]? It’s a minute and ten seconds of images with a voice over of facts about Fabergé, whose name is comically mispronounced. All it took to create was a Google Image search, a review of a Wikipedia page and a video editor. The company responsible for it is QualityPoint Technologies, an India-based web development company. A look at their site suggests to me that they’re committed to quality code and products. The stunt they pulled to wiggle onto the first page of the Google Doodle search results page with video content tells me they have a pretty advanced approach to creative search marketing. Yet, how effective is this piece of content marketing? How many of the 1500 viewers were in the market for software development services? Was there an appropriate connection between Fabergé’s birthday and the technology company’s audience which could have been an effective marketing tool? Finding connections between a business and topics popular with its target audience is elusive magic marketing. But connections made out of thin air will be eclipsed by more visceral unions in the real world. The company gets my props for putting content together quickly to capitalize on the short-lived but white hot opportunity in the SERPs. But I’d be interested to see some data that points to the return on investment before I recommend the approach. hahaha half-baked marketing. Too bad – with such creative concepts, they should be able to do a lot better at relevance matching. And it really is a brilliant concept.